This is the first game in the The Settlers series. For other games in the series see the The Settlers category. For the Nintendo DS game, see The Settlers (Nintento DS). For the iPhone game, see The Settlers (iPhone). 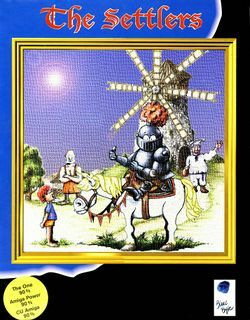 The Settlers (also known as Serf City: Life is Feudal in North America, and originally titled Die Siedler in German) is a slow-paced simulation computer game by German developer Blue Byte Software, first released in 1993 for Commodore Amiga and in 1994 for DOS. It was the first game of its type, blending together principles which had not been seen in a single game before, and defined the line of the later Settlers games. On the hardware available at the time, the game could control a maximum of 64,000 individuals, all behaving autonomously. The game is played through a mouse-operated point and click interface. The player cannot directly control units, but instead places orders to build or attack buildings. Except when attacking, units are further controlled by designating the paths on which they may walk. Compared to modern games, The Settlers is quite a slow-paced game; unlike its sequels. Some time-dependent features of the game can therefore take a long time, such as upgrading a freshly recruited knight up to the fifth and highest level. But knights also get stronger with the amount of gold possessed by the player's kingdom, and gold can be mined to this end. While the statistics dialog of The Settlers does feature a 50-hour scale, and on a big map a game may last even longer, a typical campaign is won in far less time. This page was last edited on 11 June 2017, at 22:32.